Now that was one HOT movie. Did you ever see it? Takes place during a summer Florida heat wave with William Hurt and Kathleen Turner (both hotties). There's lust, murder and suspense. Even the critters are trying to cool off. Without much success. I offered to spray them down with a hose, but they weren't too keen on that idea! So fine! Lay out there on the hot ground, I say. But if I begin to see any signs of lust, murder or suspense among you all, I'm hosing ya down! P.S. It was so unusual to catch these guys in these positions. I just happened to look out my window and all three were laying flat on the ground. The Catbirds seemed to be quite hot ... doing a lot of panting which I guess is normal when they overheat. Rocky Squirrel ... who knows! Perhaps the stone felt cool on his belly. Poor things! I hope they are OK? I can't stand more than 25 degrees! I am really terrible with heat eve though I grew up on the tropics but my body is too use to the Canadian chill now! LOL!!! I do remember that movie - good plot. Hosing down lust and suspense might be fun. Murder, ah, not so much. I guess we know that's how to tell when it's hot--That and I take my socks off!! Gosh, are those birds actually OK? 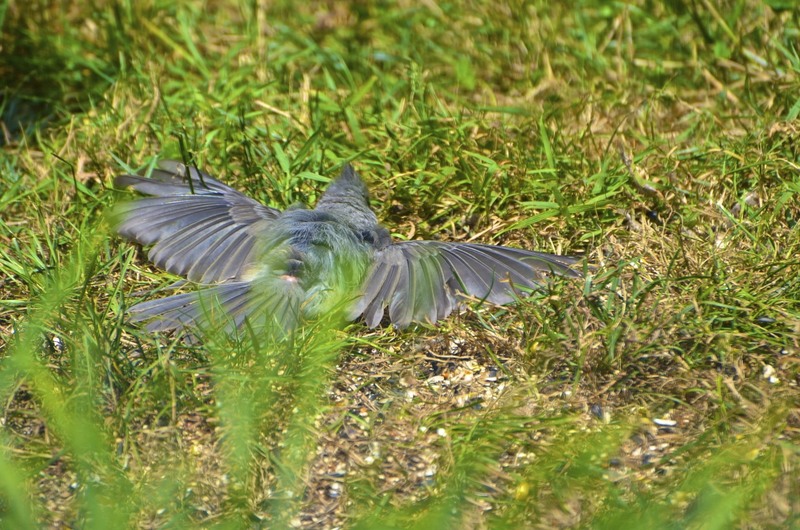 I've never seen a bird lying down like that! Great shots but I hope they are not sick or worse. I have never seen birds or squirrels lying down like this. How hot is it and is it coming my way? Yikes. 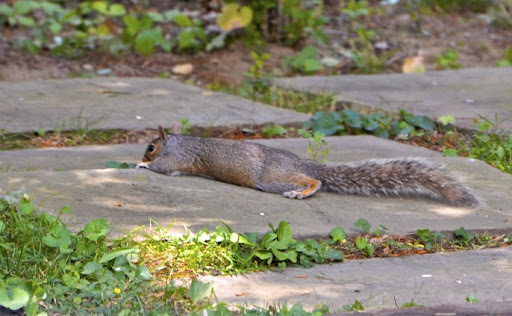 I've never seen a squirrel laid out like that. I'd have to stop and take a picture too. I would never want to be a squirrel, but often think how much fun it would be to be a bird and fly. 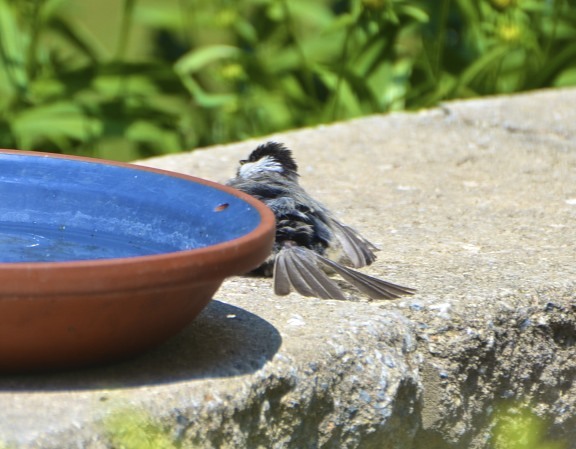 However when it gets this hot, being a bird must be no fun at all. Amazing captures! That is definitely a sign of heat! I don't believe I've ever seen birds lie down like that. I do remember body heat, such a good film! what brilliant captures! I've never seen birds do that, but I did catch a picture once of a squirrel stretched out on his tummy on a tree branch! Oh my goodness! These shots are great! That is interesting on the birds laying out. I've never seen them do that. Now the squirrels are another story. They seem to laz around all the time :). HA!! I've never seen birds do this...I was worried at first look ;) Too cute! What great captures of the "cooling off" behaviour!! If I saw that around here, I'd be getting ready to perform mouth to beak! Weird! Thanks for sharing these photos, Reena. Live and leanr. Learn. Doh! One of my all-time favorites (Body Heat). It looks like these little ones have had it with the heat you are having there :-( Hope it cools off a bit soon. That is hilarious...and crazy!! I hope you get a cool down soon! how funny..it stone and cement must feel good on their little tummies! Yes, I loved that movie! I just watched it again recently either on ON DEMAND or some TV channel. That's what I feel like doing right about now and it's nowhere near as hot here! I hope the weather gets better for you and those poor little guys! Oh my goodness, it must be hot where you are. I see our squirrels doing that sometimes but never the birds. Great photos. I have just come over from Vision & Verb. It is a bit of a con-incidence that a blackbird has been laying down (on and off) like that in my garden for the past two days. I was beginning to wonder if he was wounded. Perhaps he is just hot after all.